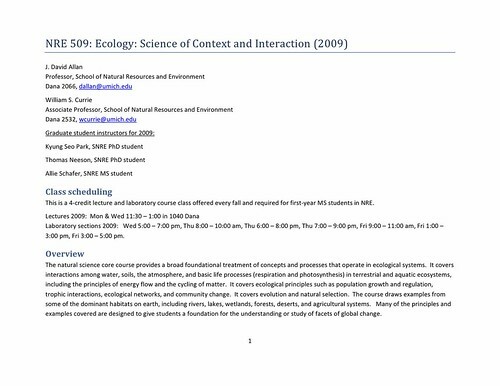 The natural science core course provides a broad foundational treatment of concepts and processes that operate in ecological systems. 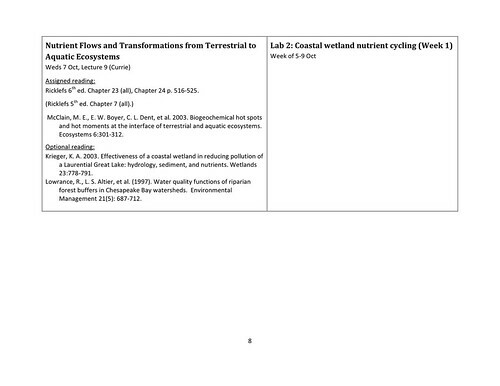 It covers interactions among water, soils, the atmosphere, and basic life processes (respiration and photosynthesis) in terrestrial and aquatic ecosystems, including the principles of energy flow and the cycling of matter. It covers ecological principles such as population growth and regulation, trophic interactions, ecological networks, and community change. It covers evolution and natural selection. 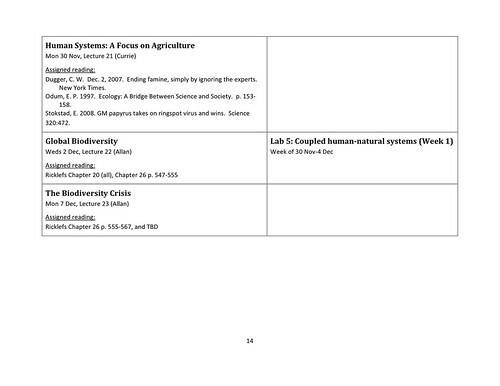 The course draws examples from some of the dominant habitats on earth, including rivers, lakes, wetlands, forests, deserts, and agricultural systems. 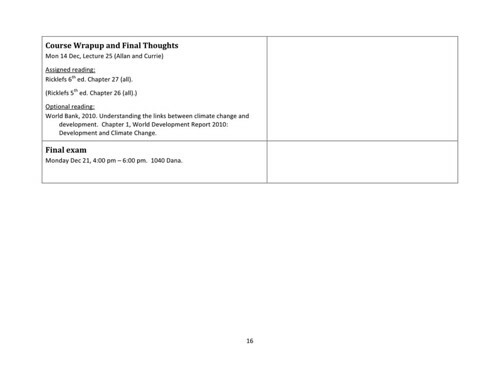 Many of the principles and examples covered are designed to give students a foundation for the understanding or study of facets of global change. To provide a common foundation in core natural sciences related to natural resources and the environment for all incoming MS students. 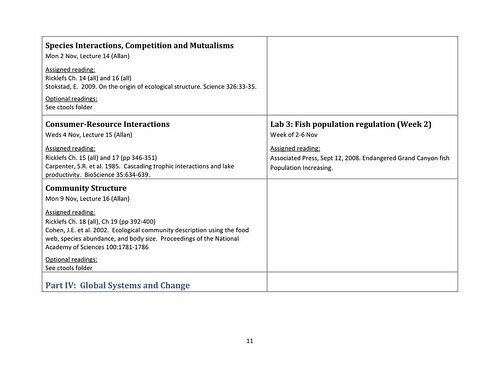 To introduce quantitative and qualitative analysis of environmental systems to all MS students while developing a systems perspective and systems modeling skills. To foster knowledge-based critical thinking and the habit of cross-disciplinary interaction among students. To provide a transition to graduate school by expecting students to assimilate both basic and advanced information from diverse sources, including the primary scientific literature. Do you wish the wiki worked differently? Have suggestions for new features or requests for pages? So what do you think? My goal was to design an interface that we could all use to more easily navigate to target pages of interest. The "Extra Info" tab is still a bit messy and I'd love other suggestions for organizing it - does most recent post first make sense? 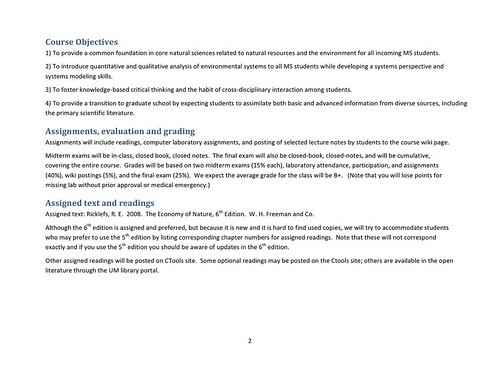 The syllabus isn't all that helpful - do you want it up or is it better just taken off? Is this layout easier? Do you have suggestions to make it better? I'm going to need some help keeping all of these pages current. If you're so inclined send me an e-mail (cdonihue) and I'll show you how I made the site, or you can just look through the code. Hope y'all don't mind the huge change and I especially hope we find it a bit easier to visit and post on. Good night! These forum postings have some pretty good potential for dialogue. Start a new thread by typing in a "Post Title" or if you'd like to respond to an already existing thread click on the "reply" link under the latest posting. Important note: once you've posted something you can't delete it (case in point: somewhere hiding in the wiki I have a bunch of very silly test posts back and forth to myself and I still can't figure out how to get rid of all of them). You can put these dialogue boxes anywhere on the wiki though so be thinking of creative reasons for discussion - test questions, philosophical/existential debates, Stella rants etc. Let's try to keep this page focused on topics pertinent to the wiki as a whole - we can add as many others as you'd like everywhere else. All you have to do is write [[module Comments]] when editing a page. 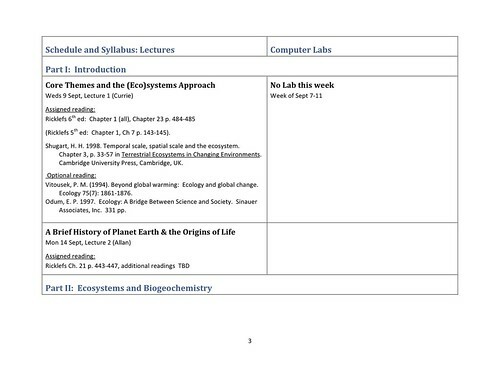 I'm thinking of deleting that blank page in the Lecture 15 section—anyone know how? Re: How to delete pages? I've had trouble figuring out how to delete pages too. The easiest way to remove it from the Lecture 15 section is to remove the tag (done). You can also "mark it as deleted" or some other such tagging, but it still floats around in the "list all pages" view. Not a big issue as there haven't been all that many that have been deleted but it could get messy. I think the only real way is for an admin to completely wipe it. 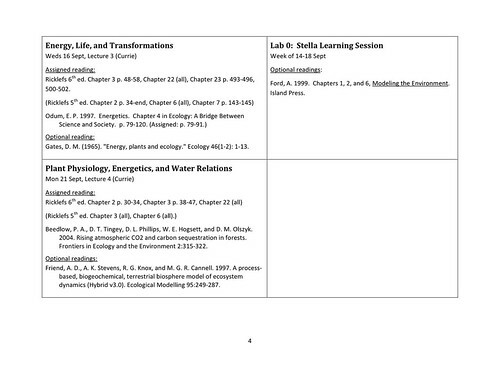 I deleted the tag though so it won't clutter the Lecture 15 section. How to add to "extra info" tab? Every time I try it just lets me edit the main page. What I want to do is create a link to a new page on the "extra info" page. I'm a noob at this. Can someone help? Re: How to add to "extra info" tab? The extra info tab is a most-recent-first collection of all pages that have a tag "extra_info" In other words, you can't edit that list in this page, simply add "extra_info" to the page you created and it will update at the top of the list (hopefully). If that doesn't work send another note. The Earth's carbon cycle has been disrupted by human activity. Burning of fossil fuels and land cover change are emitting about 7 Gigatons of C per year, steadily increasing the concentration of C and causing climate change. Because of this, producing models of C cycling is very important. Individual-based and lumped-parameter are the two types of carbon models out there now, but there needs to be a lot of modeling innovation in the future. Carbon mitigation and international cooperation in the UNFCCC, Kyoto Protocol, the IPCC and the recent talks in Copenhagen are key to stopping global climate change. There have been 5 major extinctions in the past, but today's science suggests that we are in the midst of a sixth, human-caused mass extinction. Over-exploitation, successful invasion of exotic species, widespread habitat destruction, climate change, pollution and occasional domino effects have resulted in species loss in the recent past as well as today. Habitat loss is by far the greatest threat; only 12% of the earth's land and very little water is formally protected, and the ability of these lands to act as suitable habitat are further threatened by climate change. Gap analysis allows us to identify high priority conservation areas relative to the networks of current protected lands, and past experience has highlighted some of the design issues that come with establishing nature reserves. Biodiversity has many definitions but it basically means the variations among organisms and ecological systems at all levels. In the narrowest sense it is how many species there are. There are approximately 1.8 million known species in the world and en estimated 10 million plus unidentified species. The concept of species richness describes how many different species there are in a given area. Species richness generally is higher in tropical regions and lower in polar regions. There are also regional factors that affect species richness. Specifically, wetter areas have more species richness than dryer areas because there is greater primary production. 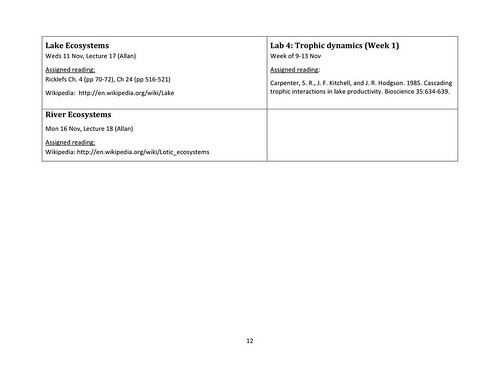 Species diversity is driven by a couple of factors including evolution specific to environment. Lastly, the equilibrium theory of diversity explains how certain areas (such as remote islands) may have less species based on the rate of colonization versus extinction. Humans have re-shaped the earth through agriculture. Any effort to produce a more sustainable economy must confront how we raise and grow animals and plants for food. Our current system is the result of several revolutions leading to ever greater mechanization, dependence on cheap petroleum, and use of synthetic chemicals. The product is a system that is impressive in its yields, but that has numerous externalities. How we will continue to raise food for a growing human population remains a challenge. Land use (the set of human actions within an area) and land cover (the physical material on a region's surface) are characteristics of a landscape that are critical for understanding landscape processes, conservation plans, and management options. These characteristics are highly variable with scale of focus, and by changing the resolution of your investigation you can get very different results. The correct resolution is a range where increased heterogeneity due to closer examination is no longer relevant to the research question. Differences in land cover (sometimes anthropomorphic, frequently not) create patches in a landscape separated by the matrix and populated by a subset of individuals from the species' meta-population. Patches, habitat fragmentation, and land use/land cover have changed through history and continue to change today causing challenges for conserving biodiversity. Only a small proportion of the Earth's water is free-flowing and fresh. This available fresh water flows through the hydrology cycle from the ocean to the atmosphere to the continents. Terrestrial water is is found on the surface, in soils and in the water table, and is affected by precipitation rates, soil characteristics, land cover, and ET Rates. Humans have had a significant impact on the terrestrial portion of the hydrology cycle due to urbanization's increased impervious surfaces, increasing runoff and dams, altering river flow. The physical and biological processes in rivers are inextricably intertwined. Fluvial geomorphology is determined by the interplay between rivers and landscapes, specifically the bank's slope, volume of flowing water and substrate sediment type. These geomorphological characteristics in part dictate the ecological communities these rivers support including such invertebrate functional groups as grazers, scrapers, shredders, collector-gatherers and predators. These invertebrate communities depend on suspended organic material in the water column and vary considerably along different river reaches according to stream flow, nutrient availability and substrate type. Lakes are formed in many ways, including glaciers, tectonics, and landslides. Once formed, lakes are characterized by seasonal turnovers of nutrients driven by temperature gradients. These temperature gradients are extremely important both ecologically and biogeochemically. Nitrogen and Phosphorus are two key elements in lake ecosystems - high influxes of these can cause eutrophication. According to Leibig's law of the minimum the mineral resource that is most scarce will be most limiting for growth in that ecosystem. A community is the complex of species living together and interlinked through feeding relationships and other interactions that govern the flow of energy and cycling of nutrients. Food webs are a model for community structure and consist of trophic levels that can be regulated by resource availability (bottom up) or predation stress (top down). Consumer-resource interactions are ubiquitous and are usually the driver of specialization. Fluctuations in prey and predator populations have a significant impact on the dynamics of the other and so are engaged in an evolutionary arms race to escape negative pressure from the other. Mutualism, commensalism, predation and competition are the primary ways in which species interact in nature. Each interaction type can have huge consequences on an individual’s behavior, life-history traits, fitness and survivorship. Niche theory is a convenient way to partition an ecosystem and understand species interactions. Demographic characteristics of a population, such as age structure, are important determinants of population viability. Population sizes fluctuate in time and space and, depending on growth and loss rates, species will either persist or disappear. Population change is a balance of rates that increase of decrease population numbers including birth, immigration, death and emigration. Populations can’t grow exponentially forever; typically they reach a carrying capacity and feel the effects of negative feedbacks. "The Ecological Theater and the Evolutionary Play"
Natural selection is the primary driver of evolution. Selection can be directional, stabilizing or disruptive but will always result in a change total gene frequencies in a population. Fitness – the number of viable offspring an individual produces – is a good metric for measuring the quality of life history traits and will impact the extent and pace of natural selection. All nitrogen transformations require biology, and most notable of those transformations is nitrogen fixation from atmospheric nitrogen gas into biologically active forms. Soil weathering will dictate the amount of nitrogen that can be retained and kept for use by plants and microorganisms. Because nitrogen is generally a limiting resource many organisms have evolved ways to capture and sequester nitrogen as soon as it is available. The nitrogen cycle is critical for primary productivity and revolves around the processes of nitrification and denitrification. Most nitrogen transformations occur in the soil and are influenced by the presence or absence of oxygen. Water, as the universal solvent, is a critical molecule for life. In addition to the hydrogen and oxygen in water life generally requires C, N, P and S, along with the nutrients Ca, K, and Mg. pH is extremely important for biological processes and can be influenced by the carbonate complex cycling and human pollutants such as NOx and SO2. Continents, Hadley cells and ocean currents influence global climate, which weathers rock, and creates soil. Soil characteristics vary with climate, extent of weathering and age. Climate and soils then dictate the type of vegetation present in every ecosystem around the world and because of the wide variety of climate conditions and soil types vegetation biomes are highly specialized and recognizable. Global climate has fluctuated significantly over geological history. Temperature fluctuations have been marked by retreating and advancing glaciers, which are primarily responsible for carving the topography of the northern latitudes. Glacial periods have numerous causes within a complicated system of feedbacks including shifting plate tectonics, CO2 levels and Milankovich cycles. Flows of carbon form the backbone of ecosystem functions. These fluxes move carbon between the atmosphere, plants and animals and soils in a ceaseless cycle. These fluxes are regulated by nutrient, water and oxygen availability, topography, disturbance regimes and successional patterns. Water and temperature are the major limiting factors of plant primary production. Plants have evolved three major physiological patterns to counter the effects of water scarcity and temperature fluctuations; they are referred to as C3, C4 and CAM. Each of these processes reflect important life-history tradeoffs made as plants expanded to different, challenging environments. Life requires energy, and plants and animals have evolved many mechanisms for capturing, transforming and storing energy for all physiological processes. Reduction–Oxidation reactions – essentially electron flows – form the basis for most energy producing and transforming processes and these flows are characterized by surrounding conditions, especially the availability of oxygen. There is a single tree of life and understanding it is critical to our study of biodiversity, speciation and conservation. All extant taxa evolved from a single progenitor 6.5 billion years ago and ever since, life has been characterized by crisis and innovation driving the diversification we see today. 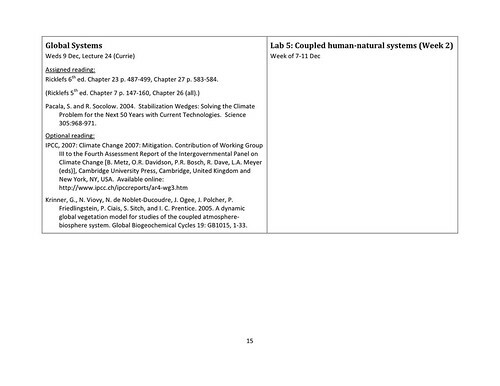 Natural systems are intrinsically coupled to human systems. 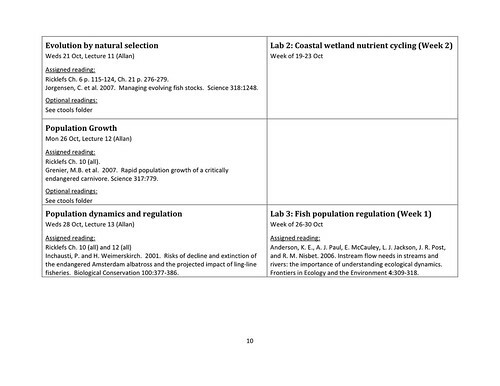 Natural landscapes and aquatic ecosystems are complex with many different scales of interactions. In the face of increasing human impacts on the earth and particularly climate change, studying, modeling and understanding these interactions is critical. 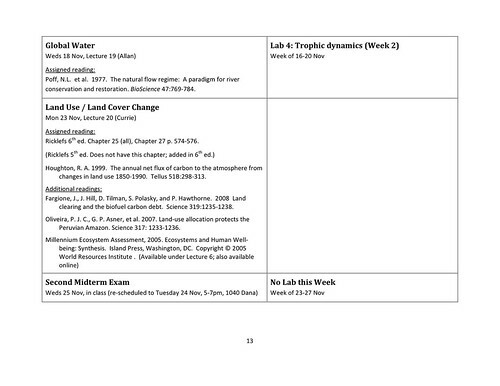 Answers to Midterms 1 and 2. Way to go echi! 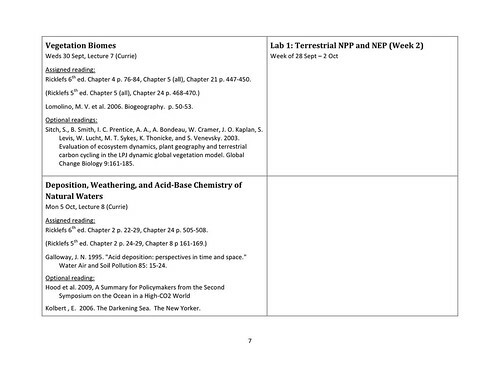 Let's all add bullet points to them - they'll be the single best study guide for the final! This review is a great idea too! Let's keep it going. They've been sorted with the most recent posts first. I would like to apologize for being one of those people that waited until the last week to be involved with the wiki. We were warned against problems that could arise with this collective action, but from the start it seemed an inevitable outcome of the assignment. I surmise that this post is quite different from other last minute additions to this community website. It will serve to provide a forum for general feedback of the feasibility and functionality of this class tool and explore the reason that this activity was pushed off until this point of the semester. I tend to be a relatively busy soul, and enjoy having activities to fill my day. Throughout my undergraduate career, I devised a system of priorities to ensure satisfaction with my progress. Accomplishing the task that I considered most important first, gives me a sense of motivation and urgency that often makes me work more efficiently. Since I have not yet gotten to the wiki post by employing this thought process, I might claim that it is then not a priority. But this, of course, would lessen the importance of what this new course tool has to offer. There is no doubt that with full participation from the class we could build a coherent and provocative study tool for future classes. So then, why has the wiki fallen so far on my list of priorities? Is it just that most of us have not had experience with website design and are flustered by the possible frustration of unknown technology? Or is there something deeper going on here? First off, I am sure a number of people had doubts about interacting with a wiki. Having had some limited web design experience, this is one of the easiest platforms to use and allows for a free form end result. This is as the professors originally intended. So, from my perspective, it would seem that the wiki is an ideal place for that open forum for class discussion. So then, is class discussion taking place? I think there are a number of study groups and impromptu lunch tables that discuss at depth a number of concepts we have touched on in class. Students in SNRE readily share resources and ideas with their peers and increase the community’s capacity for knowledge and learning tremendously. Why is this not reflected on the wiki? With the extremely fast pace of my life it is difficult to get anything accomplished that is not immediately relevant. The wiki posts has a due date that was, until now, extremely far away and the impact it has on my grade is not determined based on the timeliness with which I complete the assignment. 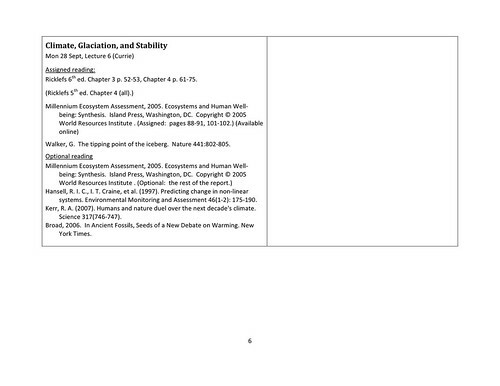 And in relation to other factors of my grade, the wiki does not have a large enough impact to get it done early. 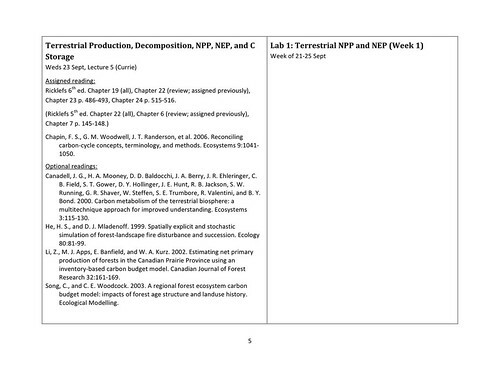 Exams, papers, grant writing, and personal research all took priority when considering my workload for the week. Often I had great ideas to contribute, but couldn’t find the time to get them on a post. 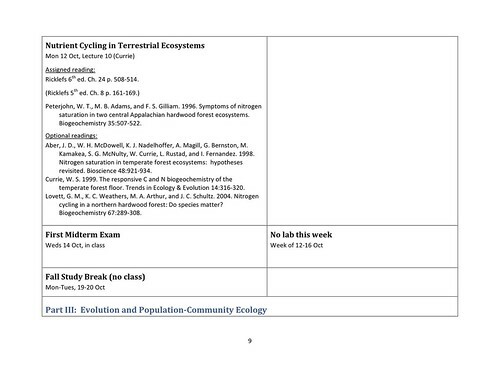 I appreciated a mention for the Metabolic Theory of Ecology by Prof. Currie one day in class as I wrote a National Science Foundation Graduate Research Fellowship application on this relatively young concept of community assemblage and wish to get more of my peers thinking about ecology in this way. Unfortunately, while focusing on writing that very grant, the post had to wait until the last minute as I go slightly crazy preparing for exams and finishing up late semester class assignments. At the announcement of this assignment, it was difficult to imagine a wiki that would have enough traffic to ensure accurate information sharing and even more difficult to see it spurring virtual academic debate. Bravo, to all of you who have consistently followed updates on the wiki and to those who have taken extra time to make the site look more professional and function more efficiently. I am interested to hear your feedback as to what motivated you to take charge of this pilot project. Also, for those of you like me, chime in and identify what it was that had you behind the eightball. As this is a working website, we have not lost our opportunity to create a well-collaborated course tool for future classes. Perhaps this job is best served at the end or just following the semester when the information is most forward in our minds following exams and we can better identify what concepts are most important and how they are related throughout the course material.